What happened next became history. A meeting was arranged by Alexandria and Stephen Patras, with Most Rev. Edward U. Kmiec, now retired Bishop of Buffalo, NY, Rev. Msgr. Casimir Ladzinski, Rev. Msgr. Thaddeus Wojciechowski, Stanley Fryczynski, Mr. & Mrs. George and Theodosia Leoniak and Mr. and Mrs. Jules Wisniewski to discuss how to help the hospitals in Poland which were lacking surgical and medical equipment. It was agreed to set up an organization that would solicit funds to purchase and ship equipment and supplies to Poland. Coincidently, it was about this time that a member, Adam Prochaski, met Dr. Zbigniew Religa, a brilliant cardiac surgeon, who with his staff of young dedicated doctors in Zabrze, was performing pediatric open heart surgery, but on only a few children. Due to the lack of surgical equipment and medical supplies they were unable to operate on the many more that needed corrective surgery. It was decided to provide Dr. Religa with assistance as quickly as possible. At the first official meeting held in August 1985 at the Polish Cultural Foundation in Clark, NJ, with about 25 interested people in attendance, the mission was discussed and how the organization would accomplish this mission. Also, at this time, Msgr. Joseph Marjanczyk and Stephen Patras suggested the name “The Polish Children’s Heartline”, which was unanimously agreed upon. Shortly thereafter The Polish Children’s Heartline became incorporated in the State of New Jersey, consisting entirely of non-paid volunteers. In dire need at this time were surgical masks, latex gloves and sutures. With donations made by The Polish Children’s Heartline’s founding members, these items made up the very first shipment in 1986 to the hospital in Zabrze. Through the generosity of members, friends and organizations, within the first year, The Polish Children’s Heartline was able to purchase six infusion pumps and additional medical supplies valued at $30,000. Shortly after beginning its association with Dr. Religa and Dr. Marian Zembala in Zabrze, The Polish Children’s Heartline then adopted the hospital in Katowice and its talented surgeon, Dr. Andrzej Bochenek, along with the Mothers’ Hospital in Lodz and its talented staff headed by Dr. Jacek Moll. Both these hospitals were in need of all the same basic items and over time these same items have been shipped one hundred fold. Along with these basic items more sophisticated supplies and equipment were sent such as heart monitors, echo cardiogram equipment, kidney dialysis machines, pediatric infusion pumps, x-ray equipment, catheters, nuclear diagnostic equipment, incubators, incubator feeding tubes, aortic balloon catheters, surgical magnifying eyeglasses, and many other items too numerous to list. Many hours were spent driving to pickup donated supplies from distributors, and many more hours used to inventory and pack these supplies for shipment. Besides having to procure these items, The Polish Children’s Heartline also was faced with transportation costs to Poland. Helping in this effort was Mr. L. Wnedkowicz of Doma Export. In 1989, the first Tree of Life was born, carved from a piece of coal by the miners in Katowice. It hangs in the Slask Centrum of Cardiology in Katowice, with commemorative hearts acknowledging contributors. A second tree, very unusual in design, was created by young art students in Zabrze and a third tree is in the pediatric division of the Mothers Hospital in Lodz. In 1990, The Polish Children’s Heartline, for the first time, ventured into the Pulaski Day Parade in New York City, with a float made by the Patras children and grandchildren. It was the introduction to Polonia of the existence of this humanitarian organization at the national level. Since 1991, The Polish Children’s Heartline has been honored to have Adam Bak of Adamba International Imports sponsor a professional float for the Polish Children’s Heartline and in 1995, founder, Alexandria Patras was honored as the Grand Marshal for all her humanitarian work. August 1998, found executive officers in Poland, at their own expense, visiting hospitals in northeast Poland, probably one of the most economically depressed regions. Visited were hospitals in Bialystok, Grajewo, Suwalki, and Wysokie Mazowieckie with particular interest focused on pediatric services. Observed were outdated facilities BUT outstanding physicians and staffs providing medical services. January 1999 saw the first of several shipments of medical supplies and equipment to the hospitals in that area. The millennium and the year 2000 arrived finding The Polish Children’s Heartline more involved in shipping supplies to Poland and facing new challenges. With the advent of the new health program in Poland, similar in nature to the HMO’s in the U.S., changes in their relationships with the hospitals and their needs began to take place. With Poland’s acceptance into the EU, Poland’s hospitals and The Polish Children’s Heartline experienced changes in having to adhere to EU regulations concerning medical supplies and equipment. This caused a change in purchasing from U.S. manufacturers to buying from primarily Polish companies thus helping Poland’s economy. To date medical supplies, equipment, and 4 ambulances, all valued at over 20 million dollars has been provided to Polish hospitals. In 2010, with the loss of our Founder, Alexandria Patras, The Polish Children’s Heartline had to take a deep breath and decide its future. And the decision was made to carry on, in Alexandria’s memory, the wonderful work she had begun and carried out in earnest. Ron Syslo continued on as President, keeping The Polish Children’s Heartline moving ahead until in 2013, Alexandria’s daughter, Doreen Patras Cramer, became President. 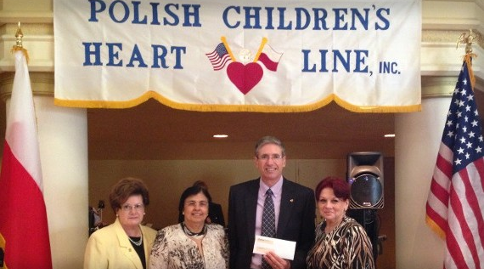 After a year of reorganization The Polish Children’s Heartline is once again reaching out through various fundraisers and events. Even with all the changes to the Heartline, in 2015 we were able to donate an Ultrasound Machine to Bialystok for $25,000 and a Defibrillator to Lodz for $9000. 2016 has enabled us to donate 10 beds and mattresses for $5000, to Suwalki, and a Double Syringe pump for $1100. We are constantly working on additional donations to the poorer hospitals in Poland. Our current fundraisers celebrate our years of helping Polish Children. In September, our Annual Anniversary Luncheon is held. With a wonderful turnout, an exciting raffle, good food and fabulous entertainment the event is always quite a success! Our Annual Champagne Gala at the Polish Consulate in Manhattan has returned to the delight of all who attend this beautiful affair. Please contact us for further information at 732-680-0680 or childshart@aol.com.